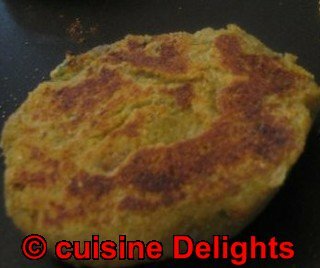 Aloo Tikki is besically made of mashed potato and various spices. "Aloo" means potato and the "tikki" means a small cutlet. This is a perfect breakfast sandwich. There was nothing else that could add and if you want to, you can add ketchup. Grated Ginger : 1 tsp. Boil and mash the potatoes when hot. In a bowl, add mashed potato, boiled green peas, carrot, green chilli, ginger, salt and mix well. Now shape into small tikki. Heat a non stick tawa and roast the tikkis with just a little spray of oil. Toast the bread slices till brown. You can apply butter on them if you want to. 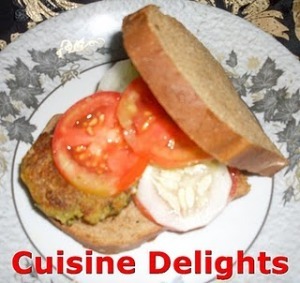 Now place a tikki, some tomato and cucumber on a bread and sprinkle salt. Finally, cover with another bread.